This cover was sent from Cumberland, ME to Locust Dale, Virginia and forwarded back with “Due 3” in manuscript. The submitter was asking if the cover is genuine and is this precancel in manuscript on the stamp. state in ink and trying to keep it all on the stamp was a pastime of a number of postmasters in the 1850s and 1860s. 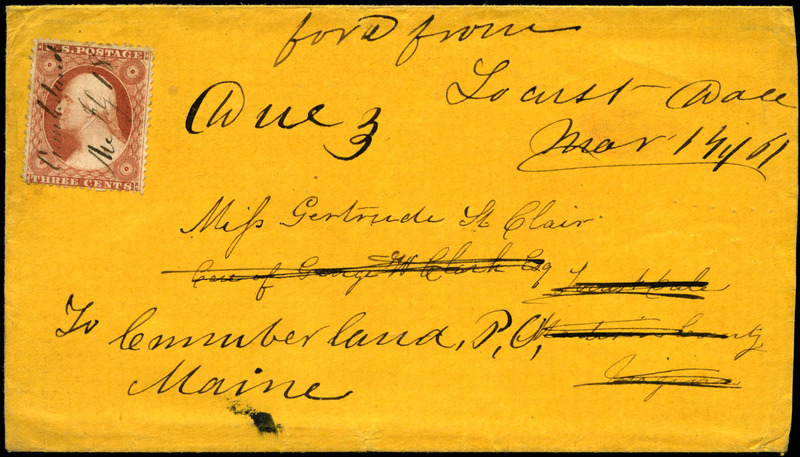 There aren’t that many around, but when they do show up they catch the eye and collectors and dealers can be forgiven for sometimes thinking they might be precancels, especially when the Cumberland, Maine post office shown here is well known for its printed straightline postmark found on the one cent 1857 stamp. 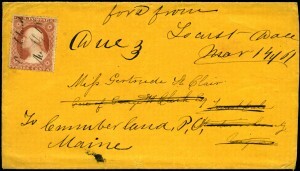 Cumberland, Maine also has circle datestamps applied to envelopes in the 1860s with a date in manuscript added when mailed. 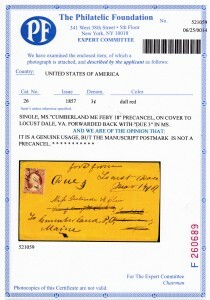 The three cent 1857 stamp on this submitted cover shows a very carefully applied “Cumberland Me Feby 18” written in ink. Reviewing the cover, it was determined that there was no evidence that the town and date were written at separate times or in different inks. It would have been an incredible waste of time to laboriously write out the name of the post officer one hundred times on a sheet of three cent stamps. The date would have to be entered separately on the day of use. 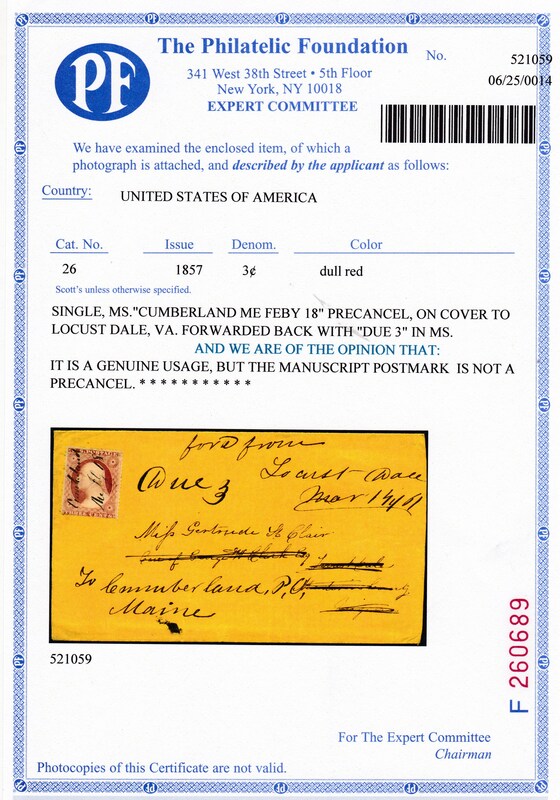 It was determined that the cover is a genuine usage of the three cent 1857 stamp but the manuscript postmark is not a precancel.